Since 2013 Gap Africa Projects have been proud supporters of wildlife Charity TESA (Thandi’s Endagered Species Association). 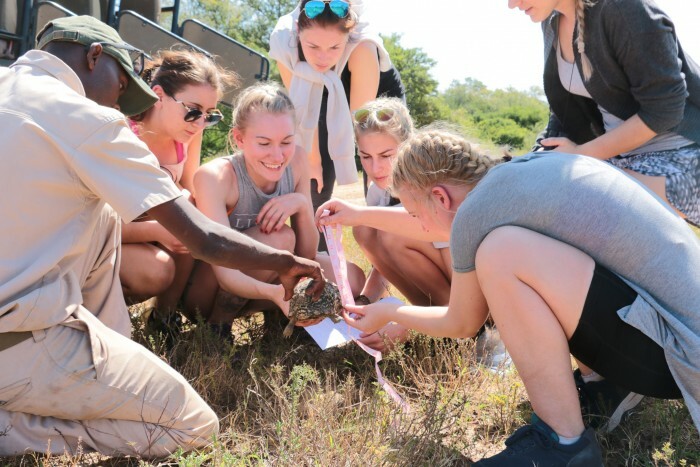 This amazing charity was founded by one of Gap Africa Projects’ former clients, Angie Goody after several trips to South Africa to understand the plight of poaching faced on a daily basis. The work that Angie and TESA have done over the years and pure dedication to the preservation of endangered species resounds with our ethics and beliefs at Gap Africa Projects, it is therefore a natural partnership that has formed between us. 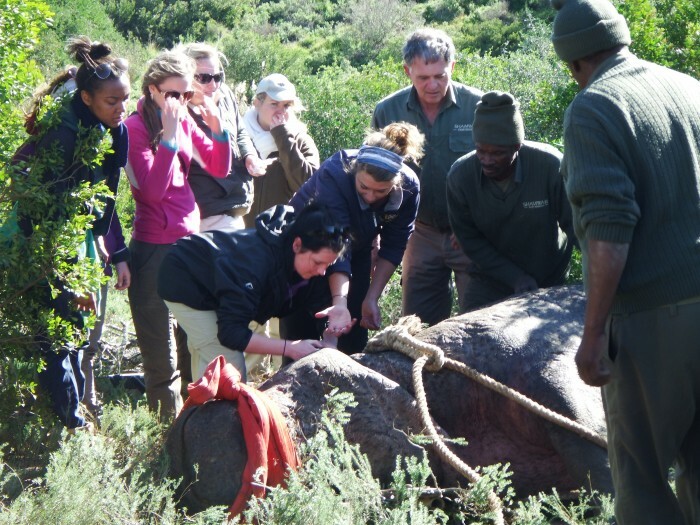 3rd March 2012 at Kariega game reserve three Rhinos were poached for their horn. Bull 84 died that night due to his injuries but two survived the initial poaching. Rightly named Themba (Xhosa for Brave) and Thandi for (Love) these two Rhinos now fighting for their lives needed help! Many of my friends followed my story on Facebook whilst I was out in South Africa in 2012 volunteering at Kariega around the time of the poaching and it touched the hearts of many. Myself especially. I have been in farming for 18 years now and dripping a cow is one thing but dripping a 3 tonne Rhino was another. Every time I close my eyes I can see Thandi and Themba’s face’s … I don’t have the blood stains of a Rhino on my clothes I have the blood stains of poachers, complete scum of whom could never be called human. Nature is less violent than them. Sadly young Themba died on the 25th March. His injuries were just to server and my poor brave soldier peacefully died in his favourite water hole. Thandi how ever continued to improve and today is back to her old bonny self less her horn and part of her face. SO WHAT DID I DO? I knew right from day 1 I was going to tell the Isle of Man and my friends across the world what really goes on in South Africa and if not to be able to change it straight away but to raise awareness. When I announced that I wanted to do a fund raiser to take some money back to Kariega with me in 2013 when I would be re visiting Kariega and volunteering also at Shamwari Game Reserve the offers came flooding in and at an over whelming rate. Unfortunately my plans to have an Island wide raffle was soon to be scuppered by our licence and gambling laws here so instead the only way round it was to have an Auction. I spoke to the land ladies of the local pub I work in and without any hesitation they said yes to being the venue for the auction. The raffle prizes were just as big as the Auction prizes. We had meal vouchers, drill sets, pictures you name it, it was in it. My biggest thing had been promoting the event. Of course I used good old facebook as well as the local radio stations, press and what better way but to hang a life size inflatable Rhino out of the pub window. I also wanted to give people the chance to remember world Rhino day so I designed T-Shirts of which I asked for minimum donation of £7. New T-Shirts will be available again this year. I was also given off the cuff donations where people had donated cash as they believed the course was a good one. I feel what has inspired people the most is the fact that I was there and had seen it for my own eyes and they had been a part of it to reading all my post and seeing the devastating pictures. It was decided with the money raised it would go towards collaring the few remaining Rhino’s at Kariega. This would include the cost of the vet, DNA, De-Horning and collaring. The cost of just over £1000/Rhino. I never believed what was to be the outcome of my fundraising efforts last year! In fact we had raised enough money to collar four adult rhinos as well as help with their Anti Poaching efforts. It was with great pleasure to present a cheque for £5000 – 72,000 rand. And to revisit Kariega this year and see Thandi and the collared Rhinos for myself. WHAT NEXT? Poaching is still on the rise and in total there were 660 rhinos killed in 2012 already this year there has been 280 and we are only in May. This though must not discourage any support! By placing tracking collars you can find the rhino’s everyday and keep a close eye on them especially if they are shy and like to hide away. They are at the end of the day wild animals and where possible should be able to live their natural lives without being threatened. Some reserves have full time monitors working during the day and APU (Anti Poaching Units) working during the night. With one particular reserve they try their hardest to protect their rhinos. For them it is not the cost of the collar or the DNA sampling it is the cost of flying the helicopter to carry out the darting and tracking of their more elusive rhinos. I was touched by their efforts and I feel if we can help these reserves protect what they have maybe we can prevent the rhino from becoming extinct. SO this year any funds I can raise either through my auction to be held either 21st/22nd September Laxey Mines Tavern Isle of Man, or off the cuff donations OR sponsorship for shaving my hair off the night of the auction will go to a Shamwari game reserve where I have recently been volunteering and helping out with the monitoring of their rhinos as well as to continue my support to Kariega. As well as just raising funds I am wanting to try and get some camera traps sponsored. They run at the cost of around £160 each. Anyone who kindly wishes to support I will keep you informed with up to date news and how the funds raised have been used. Donations can be accepted either direct transfer in to Thandi’s Acc, by post or by hand.